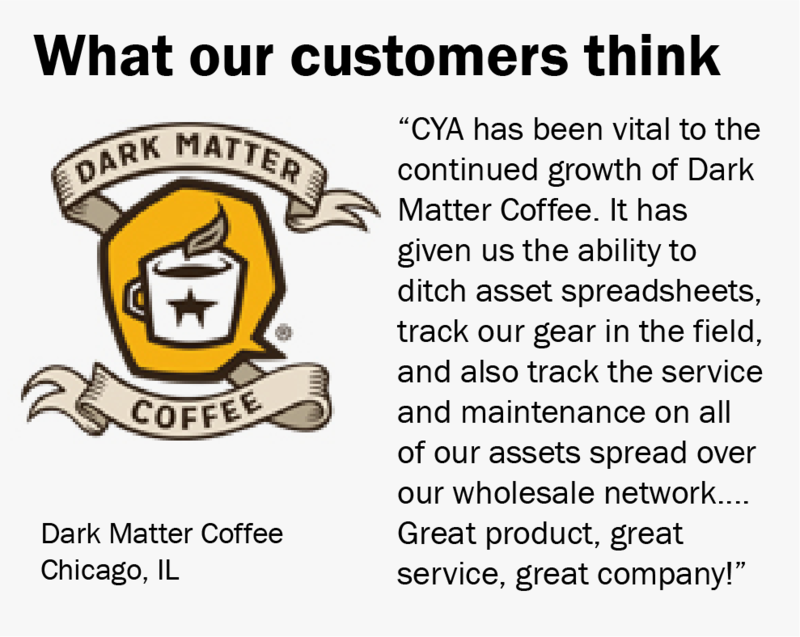 CYA Cover Your Assets is equipment and service tracking software made for the coffee industry. CYA is designed to be easy for an industry that doesn't have time for difficult. It uses the GPS on your smart phones, plus the web, to create a digital link between your assets and your locations. Once you've "captured" an asset, it's in there once-and-for-all. Now you can keep track of where it goes and what happens to it without a lot of work. Micro-update with scans, touches and swipes on the fly and in the field. When you're ready, the data is there, ready to be revealed. CYA is designed by coffee people who know the industry. This is the asset tracking system we wish we had 20+ years ago when we started in coffee, selling, loaning, moving (and, if we're really honest, losing) all that equipment. Stop using those excel sheets and capture your assets once-and-for-all with CYA. Finally, get control of your machines and get back to building your coffee brand. CYA verifies equipment, and then tracks where, when, how, who and why it is serviced. Equipment is an expensive and important part of your business. The loss of just one or two pieces of equipment per year eliminates the profit from a lot of your team’s hard work. CYA Cover Your Assets allows you to set in motion the practice of periodic scanning and recording of equipment barcodes with geo-location that confirms your assets have not ‘walked away,' or if they have, helps you to locate them and correct your records. CYA's service module enables you manage equipment interventions simply and easily, and even turn regular tech needs like water filtration and preventative maintenance into the profit centers you always imagined they could be. CYA also allows you to check and manage important business KPIs, such as your total value of equipment loaned in aggregate or by account and your ROA (Return on Asset Loaned) by account. It also helps you improve your ratio of working to non-working assets. At tax time, your CYA data will help you calculate depreciation and use tax. CYA comes with a web-based administration platform that allows you to view and value your entire equipment base easily and efficiently, helping you manage important business KPIs, and so you don’t invest in new equipment when you can easily locate idle or under-performing assets. As CYA Admin, you can empower your users to become a mobile field team verifying your assets as they go about their daily business. You decide who has access, who can edit, add locations, modify assets, or simply scan. You’ve built your business one account at a time, day after day, with thousands of hours of effort. It’s an impressive portfolio. But, over time, your equipment has moved around and things have become complicated. We know, because we've been there. CYA is designed to organize your inventory once-and-for-all. CYA creates a one-and-done catalog of your asset base. If you have a well-organized list of assets already, we'll upload them and you're off and running. If your list is less-than-perfect, just pick a machine and start scanning. Each machine you capture is at your fingertips, permanently recorded for reference at your convenience. CYA uses a simple but elegant system for managing assets. It's all about ease of use and quick understanding. When a barcode is scanned, the system compares the GPS coordinates of the phone with the assigned location in the system. If the two match? Green Light. If the two do not match? Red light. At that same moment, a scan timer starts from zero for that asset. At times set by you, the meter goes from green, to yellow, to red, reminding you that it's time to visit that asset again. Indicators roll up by location, providing the worst-case notice. Got one piece of equipment your team has ignored in a location? Red light. Of course, a scan also documents the user, the geo-location, and date/time stamp for each piece of equipment. Details like serial number, price, cost, disposition and placement can be edited with a swipe. CYA maintains a full location history, providing data on all loaned equipment by customer and location. CYA navigation is fast and intuitive. We designed the system to be used without a lot of work or preparation. CYA is Cloud-based, allowing you to access the system from your cell phone or your internet browser. The mobile app works on Android or iPhone, and the web app works on any computer. Your data updates in real time when refreshed on any device. Customers can add as many users as they want, assign them with administration or scan-only privileges. CYA data is securely stored in the Amazon Web Services Cloud utilizing industry recommended best practices to maintain data security, integrity, and accessibility. Snapshots of the CYA environment are created daily, and back-ups of the CYA database are stored off-site to ensure the persistence of company data. Additionally, multiple layers of security have been implemented to make certain that account data is only visible to authorized users.